I read this article and found it very interesting, thought it might be something for you. 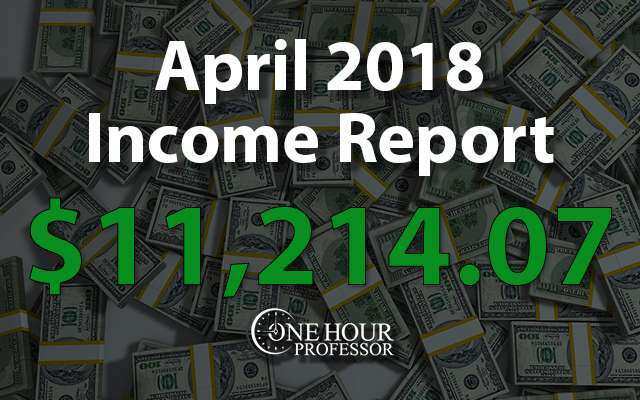 The article is called April 2018 Monthly Income Report and is located at http://www.onehourprofessor.com/april-2018-monthly-income-report/. I could sit here and be upset at the fact that I made less money in April than I did in March, but I’m not going to take that route. 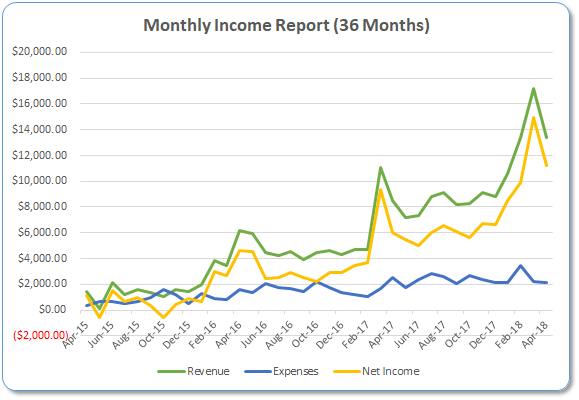 To be completely honest, I saw February and March as kind of an anomaly in my earnings because one of my websites went viral and everything was greatly exaggerated. That said, I think that April is a more realistic screenshot of what I can expect earnings to be in the near future. In the month of April I was able to make an average of $373.80 per day. Definitely not a bad month and I’m happy with the way it turned out. My goal by the end of the year is to make $15,000 a month in profit and I think with some of the positives that I saw in April, this really could be a reality. The JFTHQ website is really starting to pick up and now I’m making just about $100 a day from it. It wasn’t like that for the entire month, but towards the latter half of the month it was and I think that earnings can continue to climb. On a personal level, my wife was visiting until April 23rd so I was pretty distracted most of the month. That said, it was cool to see that my websites continue to generate income while her and I hung out and enjoyed our time together. For those of you that are tired of hearing me report that I’m making over $10,000+ per month and wondering why it can’t happen to you, I highly recommend that you http://www.onehourprofessor.com/courses/“>take my free course that explains how to start an authority website. OHP Course Revenue: It was really cool to see that my course on this website got three sales in the month of April. I haven’t done additional work to try to get more sales, apparently more people are discovering me and taking action. I’m always happy to see when somebody enrolls in my course, it just means that they’re actually taking action to try to achieve their own dreams. 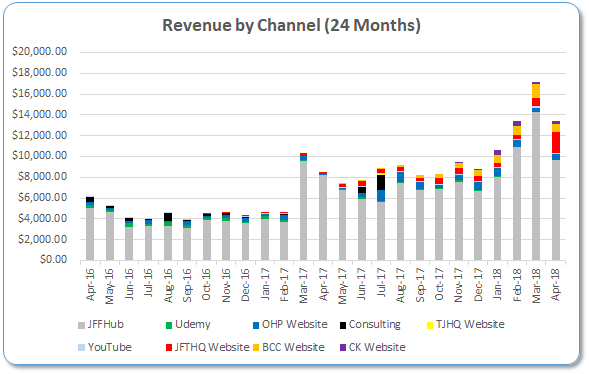 JFTHQ Overall Revenue: The thing that I first envisioned with this website is finally happening. I don’t know why Google took their sweet time in terms of ranking this website, but it’s finally starting to do really well and I think in the month of May I’m might be able to hit $3000. At least, I hope so. I’m happy to report that I have absolutely no expense outliers for the month. This is now the second month in a row that I’ve tried to stick to a regular budget and it seems like I can do this moving forward. I will say that in the month of a I’m bringing on another research assistant to help me find some link building opportunities, but that’s only going to be an extra $200 for the month. JFFHUB Update: The amazing virality of this website died down in April, but it still continued to bring in some serious money for my online portfolio. As I’ve said in the past, I really don’t do too much work here and at this point it’s pretty much on autopilot. I have a few things in the works to try to increase the income a little bit more on this website including a few additional partnerships. First off, I found another service that will pay me for leads that I can generate. Unfortunately, the cost per lead is just around $10, but I’d much rather get $10 from a lead instead of nothing at all. Secondly, I’ve reapplied to the Indeed.com affiliate program. I’m not really sure if going to accept me, but I’m hopeful that I can get back on there since it’s a new contact that I’m speaking with. We’ll see what happens here. Consulting Update: No consulting agreements for the month. If you’re interested in my consulting services, http://www.onehourprofessor.com/contact” rel=”nofollow”>http://www.onehourprofessor.com/contact“>shoot me an email. Note: My consulting is currently $250 USD/hr. Udemy Update: Another pretty weak month from Udemy in terms of course sales, but I’m totally fine with it. I’ve essentially given up on this income source and anything that continues to come in is completely passive. OHP Website Update: I FINALLY have some good news on this front. Now that I’m back in the United States and my soon to be partner in this endeavor is less busy at work, we‘re beginning to start planning how our podcast is going to work. Just before I wrote this income report, I answered an artist we’re using to create the podcast cover art. Were still working out the logistics of how the podcast is going to work and how we can produce the entire thing, but I really think it’s going to be fun and I’m excited about it. More to come on this front once we delve deeper into the logistics of making it work. JFTHQ Website Update: This website is really starting to get me excited because the market potential is much bigger than anything else I currently have. I feel that April was a turning point for this website and I’m now starting to see the rewards for the work that I’ve done over the last two years. Another big jump in referring domains and I hope that this continues. I still have about 6000 contacts I need to reach out to and find out if they’re willing to link to us and if we even get 5% of that it will be an extra 300 links. Some websites take a LONG time to succeed. I started to look over my analytics and saw that I began this website in May 2016. As much as I wanted to quit so many different times, I didn’t, and now I’m starting to finally see everything pay off. In a nutshell, I think the take away here is that you shouldn’t give up until you’re confident that you put everything into a website you possibly can. Persistence pays off. This website finally went down in earnings and while I wasn’t happy to see it, I gotta say that this website has really surpassed all of my expectations. I think that realistically I can expect somewhere between $750 to $1000 every month moving forward. I could easily sell this one and move on to something else, or I could try to launch another Amazon FBA product to it, but for now I’m going to leave it as is and see how it goes. I think it’s important to mention that one of the reasons I think the website had less page views in April is because Facebook changed some of their policies and because of this, many of the typical posts that go into the Facebook group for the community of people who follow this website were never published. Because that happened, there were a lot less clicks to Amazon for commissions and earnings suffered. I just fixed this today, so that shouldn’t be the case in May. I finally finished publishing content on this website and at this point, everything that I make is completely passive. I don’t have an editor or writer working on this anymore. This is mainly because I ran out of things to write, so now I’ll just let it sit and collect money for me. The calendar that I launched for this website on Amazon FBA is still getting at least a few sales every week and it’s really surprising to me. I have no idea why somebody would buy a calendar for 2018 in the middle of the year, but that’s exactly what’s happening. After seeing all the purchases that this product has had, I’m comfortable with launching another calendar in 2019 but I’ll get the timing right this time and have it ready by Christmas of 2018. CK Website Update: This website pretty much stayed the same from March to April. I’ll be honest in saying that this was good to see considering I was worried that Armageddon was going to continue for this one. My focus was 100% on this website until the JFTHQ website recently started earning significant income and now all of my efforts have shifted to that entity. With the CK website, I intend on leaving it as is for now and will continue to publish three blog posts to it every single week. I’m also still link building actively to this website and were in the midst of creating another database that should increase the pages of the website, but also the amount of links that it gets. The way I see it, this website is going to be a monster once it’s finally doing what I know it can do, but it’s going to take a lot of time to get there. Referring domains increased a tiny bit in the month of April but I started to link build again and I think that by the end of May there should be another big jump in the back links. Income pretty much maintained at the same level it was at previously and I can’t really complain about that. Part of me is contemplating pulling all of the ads off of this website as I started to see a decrease in rankings right after I put them up, but I’m really not 100% sure if that makes sense yet. Persistence Pays Off: I think I already knew this, but being persistent with websites is probably the number one way to be successful. I really wanted to quit on the JFTHQ website numerous times. In fact, I remember that at one point I was contemplating selling it because I couldn’t seem to get things to work. I remember that I got so frustrated that I determined the only thing I was going to do was build links to the website because I didn’t know what else would improve it. Luckily, my persistence and unwillingness to sell really paid off and now I’m starting to make some serious money from it. Ads (maybe) Can Hurt Your SEO Rankings: The jury is still out for this one. As I mentioned above, the CK website seems to have really taken a hit and this happened right after I implemented Google AdSense ads. I’m not 100% sure yet if that was the cause, but I think that it’s a pretty weird coincidence that the sites ranking started to tank right after I put them up. I’ll let you know the finding I have in May if I pull these down. Backlinks Are Crucial: I almost gave up on JFTHQ and then I decided the only thing I could do was build back links. As you can see from the traffic numbers and the earnings, backlinks are still essential to succeed and the more I build, the better my portfolio gets. Now that everything has died down and my wife isn’t around to distract me, everything is back to normal. I’m working my long days, but I’m able to focus on growing my business as much as possible in the year of 2018 and hopefully my wife and I can enjoy it in 2019. To be honest with you, I’m happiest when my schedule is completely open and I can do whatever I want to do every single day. I was able to do a lot of that in the month of April. Unfortunately, I was only able to get nine links to this website in the month of April. However, this wasn’t because of my lack of trying. It was because many of the people that I outreach to weren’t available for about a week and a half. I can’t get into too much detail without giving away the niche, but this website is in the public sector and there are certain holidays and times off that these people are entitled to. I was very close to succeeding with this one, but it just didn’t happen. The database on the CK website has been completed for all US entities, but I decided to go international with this database and there is still quite a bit of buildout to be done. That said, I have somebody working 40 hours a week on this and it’s expanding very quickly as their fully trained to do this project themselves. What Are my Goals for May? I have seen some serious success with my backlinks in the past and because of this, I want to focus a little bit more on them in the month of May. I think the past has shown that the more links I get, the more traffic I get and traffic on the websites means more money. So, I want to make sure that I get at least 30 back links to my portfolio of websites in the month of May. My assistant is getting close to finishing the International database buildout that I mentioned above, and I want to get her started on the new one that I plan on building. I’ve already had somebody doing research for this particular database, so I’ll reassign my assistant to begin the build out and to create the additional pages. This goal is a little bit vague because I’m not sure exactly what we’re going to do yet, but I’d like to get everything figured out in the month of May so that we can start recording for our podcast in June. There’s definitely still a lot of things to figure out and I want to research how to do this successfully before we start interviewing people. Hopefully in the month of May we can get the plans all set.